As a dog owner, you want to ensure that your pet is as healthy and happy as possible. Ensuring that you are feeding your furry friend a diet that is rich in essential vitamins, minerals, and nutrients is absolutely essential for his health and well being. But selecting the best dog food can be a challenge. There market is inundated with a variety of options from so many manufacturers, which can make choosing the highest quality, most nutritious pet food a difficult task. When considering what type of dog food you should feed your pup, the first rule of thumb is to choose options that are made from a trusted manufacturer. Purina happens to be one of the most reputable makers of dog food on the market. Offering a wide variety of options that feature premium quality ingredients, you can rest assured that your pup’s nutritional needs will be met when you feed him Purina dog food. But narrowing down the choices from Purina can also be tough because they make so many different types of foods. Options include dry dog food, wet dog food, dog food for sensitive stomachs, food for small dogs, and food for large dogs; and those are just some of the options available! To help you narrow down the myriad of choices from Purina, we’ve enlisted the help of veterinarians and specialists in animal nutrition. We’ve also read through the countless Purina dog food reviews that customers have shared. Our research has led us to choose the following five options as our top picks for the best Purina dog food on the market. What Sets Purina Dog Food Apart from the Crowd? Now that you have seen our top five choices for the best Purina pet food, let’s take a closer look at each option. Below, we offer a more detailed description of each of our picks, including the ingredients they feature, what we like about them, and what other pet owners have said. Once you’ve read through the reviews and selected what you think is the best Purina pet food for your pooch, click on the buttons to find the best prices currently available on Chewy and Amazon. Protein is a vital nutrient for dogs. This essential nutrient helps to build their muscles, strengthen their joints, and protect their bones. By feeding your dog a high protein dog food, you can help him avoid developing conditions like hip and elbow dysplasia, a condition that is highly common among certain breeds, such as Great Danes, German Shepherds, Labrador Retrievers, Boxers, and other adult dogs. 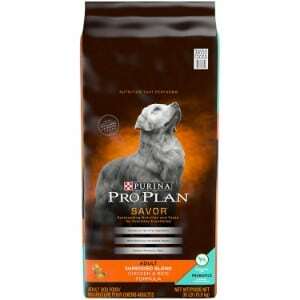 If you’re looking for a food that is rich in protein for your pup, Purina Pro Plan Savor Shredded Blend Formula Adult Dry Dog Food is definitely worth considering. The first ingredient in this formula is high quality protein that has been sourced from chicken. It’s also formulated with live probiotics to promote improved digestive health. Other essential nutrients in this formula include vitamin A, Omega 6 fatty acids, and linoleic acid, which will help to improve the health of his coat and skin. However, do be advised that this formula does contain wheat, corn, and soy, so if your pup has a sensitive tummy, you might be better off choosing a dog food for sensitive stomachs. But with that said, customers who feed this food to their dogs say that they love it. In fact, many pet owners say that it’s the only option that their highly picky eaters will even consider eating. Final Verdict: For a protein-rich food that your dog will love, Purina Pro Plan Savor Shredded Blend Formula Adult Dry Dog Food is a great choice. It features real meat as the first ingredient and is packed with essential nutrients, including omega 6 fatty acids, and glucosamine. While some owners said that it caused bad breath, that could be a result of several other things; not necessarily the food. Strong muscles are important for dos of all ages, but particularly adult dogs. That’s because protein helps to support the strength of their muscles, which can help to stave off musculoskeletal issues, such as hip and elbow dysplasia. If you want to ensure that your pooch is receiving optimal amounts of protein, then consider feeding him Purina ONE SmartBLen True Instinct Natural Dry Dog Food. This Purina dog food offers a protein content of 30 percent, and that protein is derived of real turkey and venison (which are the first ingredients featured in the recipe). This dry food is also packed with essential vitamins and minerals to ensure that your pet is receiving a well balanced, highly nutritious meal. Additionally, this food contains glucosamine, which further helps to support the health of your dog’s joints so he can continue living an active lifestyle. This dry food is a mix of crunchy kibble and meaty morsels to satisfy your furry friend’s palate; in fact, it contains double the meaty morsels that other Purina pet foods contain. Completely free of poultry byproduct meal, preservatives, and artificial flavors, you can rest assured that your canine companion will receive the highest quality food to meet his unique dietary needs when you feed him Purine ONE SmartBlend True Instinct Natural Dog Food. 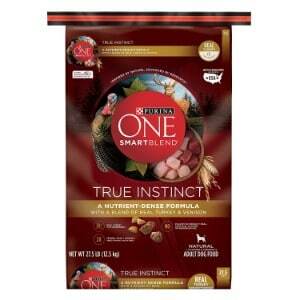 Final Verdict: Overall, we were very impressed with Purina ONE SmartBlend True Instinct Natural Dry Dog Food. Our panel of experts said that it is made of premium quality ingredients and that it is a great source of protein. Most customers also said that they had a positive experience with this pet food. As for skin irritations that some say this food has caused, it cannot be proven or disproven that the food is the cause of the irritation. Purina’s Pro Plan SPORT Performance is specially formulated to improve a dog’s metabolic rate and maintain his lean muscle mass. This formula contains 30 percent protein and 20 percent fat to ensure your pet is receiving well balanced nutrition to support his overall health and well being. It is the ideal option for adult works and hunting dogs, as well as those that compete in agility competitions, as it will provide them with the fuel they need to maintain an active lifestyle. The first ingredient in this Purina dog food formula is real chicken. It also contains high quality sources of carbohydrates to further sustain energy levels. The addition of amino acids will further nourish your dog’s muscles. Calcium, vitamin C, phosphorus, and selenium are just some of the other essential vitamins and minerals this dog food contains. Based on customer reviews, dogs love the flavor of this food. Customers also say that it improves digestive health and keeps pet’s full for long periods of time. 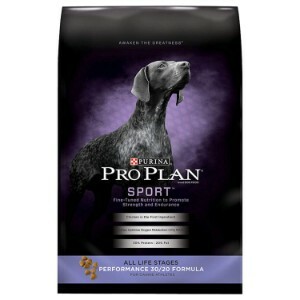 Final Verdict: For adult dogs that have a high energy level or live active lifestyles, Purina Pro Plan SPORT Performance 30/20 Formula Dry Dog Food is definitely worth giving a try. This formula features a blend of 30 percent protein and 20 percent fat to fuel your dog and promote the strength of his bones and muscles. Most pet owners say that it offers great results and that their dogs enjoy the taste. If you have a large breed puppy, it’s important to ensure that he is getting the nutrition that he needs so that he can grow and flourish. Purina Pro Plan Focus Puppy Large Breed Dog Dry Food is an excellent option to use a dog food for German Shepherds, a dog food for Golden Retrievers, or any other large breed puppy. 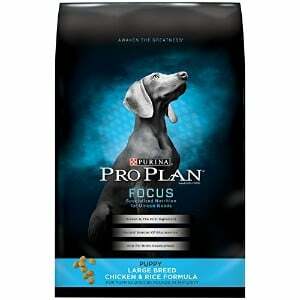 Like all Purina products, real animal protein is the first ingredient used in the Pro Plan Focus Large Breed dog food. In this formula, real chicken is the first ingredient. The addition of fish oil derived DHA will help to support his developing vision and brain, and glucosamine will help to ensure that his joints and cartilage are developing properly, too. This dry dog food for puppies also contains antioxidants to strengthen the immune system. Other vital nutrients include vitamin A, linoleic acid, and omega 6 fatty acids to promote healthy skin and coat. Do note, however, that it does contain corn grain and corn gluten meal, so if your pup has a sensitive stomach or sensitive skin, you might want to consider another option. However, with that said, customers have reported that their dogs love the taste, and that they are very pleased with the results. Final Verdict: For a high quality dog food for your large breed puppy, Purina Pro Plan Focus Puppy Large Breed Dry Dog Food is highly recommended. The formula offers the perfect balance of essential vitamins, minerals, and other nutrients to ensure proper development of a puppy’s systems. While some users did say that they believe it caused upset tummies, that’s likely because it contains corn-based products; if that’s the case with your pooch, consider using a dog food for sensitive stomachs. Last, but certain not least on our list of the top five Purina dog food options is Purina One Smart Blend Naturally Healthy Weight Formula Adult Dry Dog Food. If your adult dog has packed on the pounds, a great way to help get his weight under control while ensuring that he is getting the nutrients that he needs is by feeding him a dog food for weight loss; and this option from Purina is designed to do just that. As always, the first ingredient in this Purina dog food is protein that is sourced from real animals; in this formula, turkey is the source of protein. This dog food is specially formulated to support weight loss, as it contains 25 percent less fat and 1 percent fewer calories than other types of dog foods. Featuring a blend of antioxidants to strengthen the immune system, and glucosamine to support optimal joint health, you can rest assured that your pup will lose weight and receive the nutrition that he needs when you offer him this food. 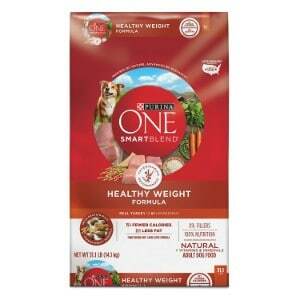 Final Verdict: If you’re on the market for a high quality weight loss dog food that’s made by a reputable manufacturer, Purina ONE SmartBlend Natural Healthy Weight Formula Adult Dry Dog Food is worth trying. Most reviewers said that they found that it offered great results for weight loss, and that their pets loved the flavor. As a pet parent, you want to provide your furry family member with the best care possible. To that end, you have made sure that he has the very best products, including a dog crate, dog bed, dog playpen, dog house, and outdoor dog kennel. Of course, you also want to ensure that your pet’s nutritional needs are being met. You’ve chosen a fantastic dog bowl that he can comfortably eat out of, but you aren’t sure what type of food to put in that bowl. Trying to choose the best possible dog food for your pup can be a challenge. There are so many options to choose from, and narrowing down the choices can seem rather daunting. If you’re wondering whether or not you should offer your pet Purina dog food, keep on reading to learn more about this manufacturer, and to learn why it has been such a well-known dog food brand for so many years. For more than 100 years, Purina has been committed to making the most nutritious foods for pets. To ensure that the dietary needs of dogs are met, they offer several different types of formulas, including options for dogs that are of specific sizes, ages, activity levels, and more. All foods are made with the highest quality ingredients and features animal-based proteins as the first ingredient. Animal proteins used include turkey, chicken, and venison. They also ensure that their food options contain essential vitamins and minerals, as well as other nutrients, like fatty acids. If you read through the countless Purina dog food reviews, it’s easy to see that it consistently ranks as a top dog food brand. Happy pet parents say that they love how well balanced the food is and that it’s the perfect source of nutrition, while dogs love the flavor. With their long-standing success, it’s easy to see that so many pet owners around the globe are pleased with Purina dog food. But what is it that sets the manufacturer apart from other dog food brands? Animal proteins that are derived from chicken, turkey, or venison (other sources of protein may be introduced in the future). However, it should be noted that many of the formulas made by Purina do features corn, soy, and/or wheat. Therefore, if your pup has a sensitive stomach or allergies, you might want to consider investing in another food selection; or, you could look into Purina’s sensitive stomach dog food. But, if your dog doesn’t have a sensitive stomach or allergies, then he or she shouldn’t have any problem handling the five Purina dog foods that have been discussed in this review. Additionally, your dog will be able to gain from the wealth of nutrients that their food does feature. No matter which Purina dog food formula you choose, your pup’s musculoskeletal system will be strengthened and maintained, the health of his skin and coat will flourish, and even his eyesight and cognitive function will be enhanced. When it comes to the health and wellness of your pet, choosing a high quality dog food from a reputable manufacturer that features premium ingredients is an absolute must. Purina offers a wide range of foods that are designed to offer optimal health benefits for dogs of all ages, sizes, breeds, and activity levels. They even offer formulas that can help control your pet’s weight! The top five Purina dog foods that we have featured on our list are sure to provide your four legged family member with a wealth of benefits; however, if you do decide to serve your furry friend one of the other Purina dog food formulas, you can rest assured that he will receive the essential nutrients that he needs to support and improve his overall health and well being. Your dog’s health is paramount; make sure that you serve him food that is specially formulated to meet all of his nutritional needs. With Purina dog food, you will have peace of mind knowing that your dog’s health will be in the best care, and your pup will love you even more for taking such good care of him!